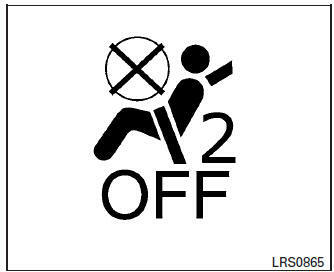 The three-point seat belt with Automatic Locking Retractor (ALR) must be used when installing a child restraint. Failure to use the ALR mode will result in the child restraint not being properly secured. The restraint could tip over or be loose and cause injury to a child in a sudden stop or collision. Also, it can change the operation of the front passenger air bag. For additional information, refer to “Front passenger air bag and status light” in this section. For additional information, refer to all Warnings and Cautions in the “Child Safety” and “Child Restraint” sections before installing a child restraint. NISSAN does not recommend the use of the lower anchors if the combined weight of the child and the child restraint exceeds 65 lbs (29.5 kg). If the combined weight of the child and the child restraint is greater than 65 lbs (29.5 kg), use the vehicle’s seat belt (not the lower anchors) to install the child restraint. Be sure to follow the child restraint manufacturer’s instructions for installation. 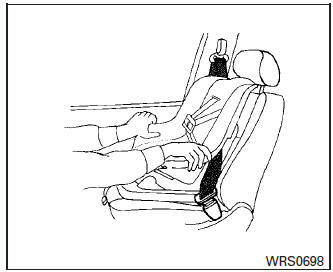 If necessary, adjust or remove the head restraint/headrest to obtain the correct child restraint fit. If the head restraint/headrest is removed, store it in a secure place. 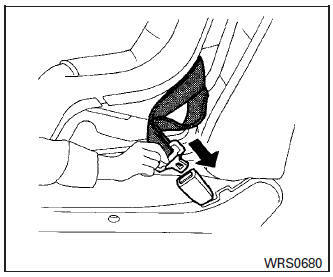 Be sure to reinstall the head restraint/headrest when the child restraint is removed. 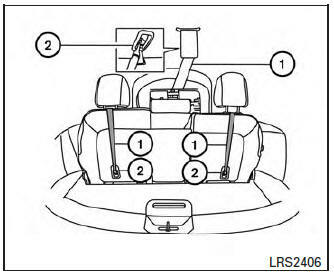 For additional information, refer to “Head restraints/headrests” in this section for head restraint/headrest adjustment, removal and installation information. 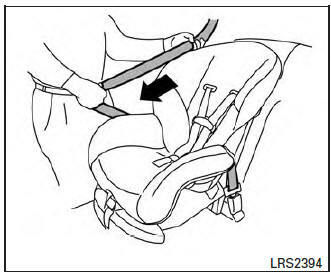 If the child restraint is equipped with a top tether strap, route the top tether strap and secure the tether strap to the tether anchor point (2nd row installation only). For additional information, refer to “Installing top tether strap” in this section. Do not install child restraints that require the use of a top tether strap in seating positions that do not have a top tether anchor. 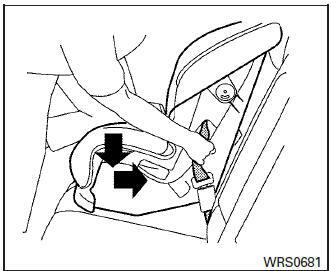 If the child restraint is installed in the front passenger seat, place the ignition switch in the ON position. The front passenger air bag status light should illuminate. If this light is not illuminated refer to “Front passenger air bag and status light” in this section. The child restraint top tether strap must be used when installing the child restraint with seat belts. Remove the head restraint/headrest and store it in a secure place. 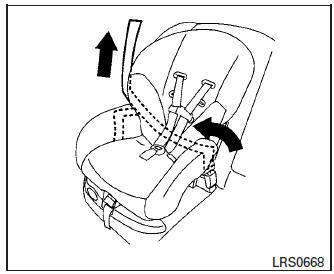 Be sure to reinstall the head restraint/headrest when the child restraint is removed. 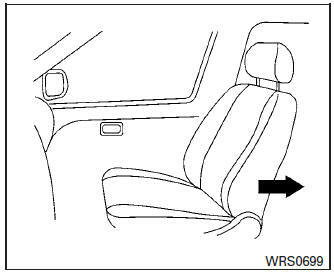 For additional information, refer to “Head restraints/headrests” in this section for head restraint/headrest adjustment, removal and installation information. Open the top tether anchor 2 cover located on the ceiling. Secure the tether strap 1 to the tether anchor point 2 on the ceiling behind the child restraint. Tighten the tether strap according to the manufacturer’s instructions to remove any slack. Make sure the head restraint/headrest does not contact the top tether strap. If you have any questions when installing a top tether strap, consult your NISSAN dealer for details.